Adult Bald Eagle with chick in nest at Pelican Harbor on Santa Cruz Island. Historically, Bald Eagles nested and lived among all of the Channel Islands. However, by the early 1960s, Bald Eagles disappeared from the Channel Islands due to human impacts, including the introduction of DDT. The overall goal of this restoration effort is to create a self-sustaining population of Bald Eagles on the Channel Islands. Restoration efforts on Catalina Island have been conducted since 1980, and efforts on the northern Channel Islands began in 2002. The restoration of the Bald Eagle back to the Channel Islands has been a major focus of the Montrose Settlements Restoration Program (MSRP) over the past decade. Watch a film about Bald Eagle restoration on the Channel Islands! From 2002 to 2006, MSRP partnered with the Institute for Wildlife Studies to release 61 Bald Eagle juveniles on Santa Cruz Island. Since their release on Santa Cruz Island, the eagles have spread out among the Channel Islands and biologists have documented nesting on Santa Cruz, Santa Rosa, Anacapa, Santa Catalina, and San Clemente Islands. Biologists monitor Bald Eagles throughout the Channel Islands. Annual monitoring involves searching for new nesting pairs, collecting data on breeding attempts, tracking eagles, and conducting contaminant analysis. 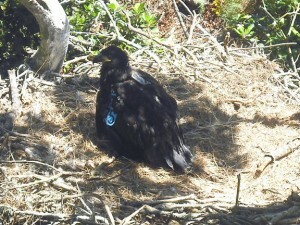 Prior to a chick fledging from a nest, biologists place wing markers, and a leg band onto the eaglets. They also take blood samples for contaminant and stable isotope analysis. This information helps biologists to monitor the movements, survival, and health of the Bald Eagle chicks. 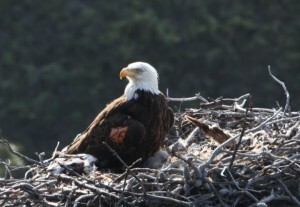 First known Bald Eagle to hatch on Anacapa Island since 1960. Photo was taken in 2011. In 2014, a total of 15 chicks (5 on Santa Catalina, 6 on Santa Cruz, and 4 on Santa Rosa) in 10 nests hatched on the Channel Islands. Of the 15 chicks that hatched, 14 fledged, which was slightly lower than the 16 fledglings in 2013. Catalina Island had a poor year in terms of reproductive success with only 4 chicks fledging from 7 nests. The explanations for some of the nest failures on Catalina Island are likely not related to DDT contamination but to natural events. The West End nest pair had a new female this year and a new nesting pair was discovered at Empire Quarry. Both of these nests were not able to produce any chicks this year. It is common for first time breeding pairs to have a “learning curve” during the first couple of years. Also, another very well-established pair known as Twin Rocks likely failed in 2014 because the female is 30 years old and her age may negatively impact breeding success. Biologists discovered a new nest on the U.S. Navy-owned San Clemente Island this year. This is the first Bald Eagle territory on San Clemente Island in over 50 years! It is unknown if the pair actually bred, but it is very encouraging to see the expansion of nesting territories to 5 of the 8 Channel Islands. As of the end of December 2014, scientists estimate that there are at least 43 Bald Eagles on the California Channel Islands. Biologists use GPS and VHF radio transmitters and visual surveys to follow the movements of Bald Eagles that were released or hatched on the Channel Islands since restoration began. In 2014, 30 bald eagles that were released or hatched on Santa Catalina Island in previous years were seen, and 32 eagles that were released on Santa Cruz or hatched naturally on the northern Channel Islands in previous years were also seen. Blood samples are collected from all birds released on Santa Cruz Island around 11-12 weeks of age for baseline levels of contaminants in their blood. Biologists successfully recaptured seven Bald Eagles on the northern Channel Islands since 2002 to observe any increases in contaminant levels. Recaptured individuals showed a significant increase in DDT levels compared to baseline levels. The question of whether or not such increases impacts their reproduction will continue to be monitored over time.